Jacobs Castle was located on a bluff overlooking the Potomac River in Arlington Virginia. It was built by Dr. J. Bay Jacob's and his wife Eva around 1950. Eva died in 1979 and her husband followed her in 1988. 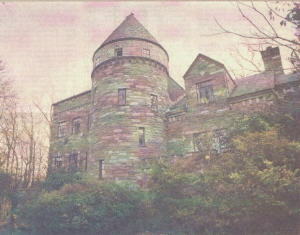 Before he died, Dr. Jacob's offered the castle to his son who declined because he thought it would take too much upkeep. So Dr. Jacob's who was chief of obstetrics at Arlington hospital, deeded it to the American College of Obstetricians and Gynecologists, which later sold it to a developer. The developer planned to develop some of the land and use the castle as a community center, but he went bankrupt and the bank foreclosed on the property. A new developer acquired the property and may have tried to save the building, but it was not up to federal handicapped standards and would have cost a lot of money to renovate it to meet those standards, so in 1994, the castle was torn down and the property was turned over to the Arlington county government for use as a park. Why this unique building was not saved is beyond me. I guess this is an example of our tax dollars at work.